The definition of a LULA elevator is in its name: It’s a limited-use, limited-application elevator. A LULA elevator is an economical solution for those who need to provide accessibility for those with disabilities. It’s like a combination of a small commercial elevator and a wheelchair lift: While it’s smaller than a traditional elevator, it can carry more weight and move more quickly than a wheelchair lift. Why Choose a LULA Elevator? A LULA is an ideal elevator for adding accessibility to churches, small office buildings, and other public buildings up to three levels. It’s smaller in size than commercial passenger elevators and much easier to integrate into a building. Though smaller in size than standard residential and commercial elevators, limited-use/limited-application elevators are compliant with the Americans With Disabilities Act (ADA) and capable of accommodating wheelchairs. In fact, some manufacturers advertise limited-use elevators as the perfect combination of a regular elevator and a wheelchair lift. A LULA lift can be a great way to provide accessibility to all levels of your building if you don’t have enough space to install a bulky commercial elevator. 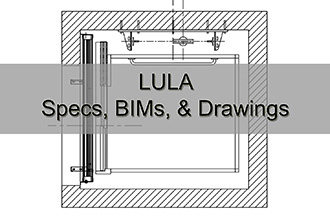 The modest specifications of a LULA elevator are some of its biggest advantages. Its small size allows it to be installed in many more places than regular-sized elevators. In addition, concrete is not a necessary component of its installation; its hoistway can be created using existing wood or drywall. Given this, limited-use elevators can be an especially smart solution for old residential buildings that are built out of these materials rather than the more modern elements of concrete and steel. A LULA elevator meets ADA requirements but will not accommodate a gurney; it must be approved by local authorities. Only requires a 14″ pit. Ceiling height on upper landing only requires 106 inches for remodels or 134 inches for new construction. Standard cab sizes on limited-use elevators are 48 inches wide by 54 inches deep or 42 inches wide by 60 inches deep. Travel speed is limited to 30 feet per minute. A LULA elevator travels up to 25 feet. How Much Does a LULA Elevator Cost? When you factor in installation and maintenance, LULA elevator costs are generally much lower than those for a standard commercial elevator, making the purchase of one of these small elevators an incredibly economical decision. At Nationwide Lifts, we have limited use/application elevators for sale that can take your business or residential building to another level. Contact us today to request a free catalog or get a free quote on our LULA elevator prices to turn a little elevator into a big hit in your building!